Media Production is an industry focused-course drawing on core disciplines in TV production, film, audio production and digital media design. We have designed the course to equip you with the practical, creative and commercial skills needed to succeed in the creative media sector. 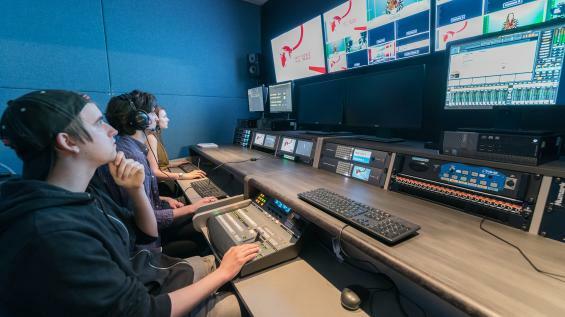 The course is delivered at the state-of-the-art Media and Journalism Centre in the heart of the city and at the University Centre main campus where you will learn under the guidance of current industry professionals and be given a practical grounding in TV, film, audio production, digital media design and scriptwriting. During your time with us you will have the opportunity to work with local and regional partners in Peterborough and undertake exciting commissions with local media organisations. You will also have the opportunity to learn from creative practitioners and media professionals in our guest speaker events organised by students and staff. Learn with industry professionals with experience in both digital and print media. Undertake a live brief or commissions with a regionally-based media company. Learn at our state-of-the-art media centre located in Peterborough city centre. When studying this course at University Centre Peterborough, we will timetable the teaching as two full days a week over two semesters per year (part-time will be one to two full days a week over two semesters per year). I am the Course Leader for the BA (Hons) Media Production degree at University Centre Peterborough. I have been responsible for the course since January 2013 and have been teaching in further and higher education since September 2007. As well as overseeing the Media Production course I also lecture on the BA (Hons) Journalism and the BA (Hons) Performing Arts programmes at University Centre Peterborough. Before I started teaching full-time, I spent 18 years working for the Peterborough-based magazine publisher EMAP (now Bauer Communications). I was the editor for both consumer and B2B publications and worked closely with some of the UK’s leading technology manufacturers and exhibition companies. I have had a long association with Westacre Theatre in Norfolk. As well as contributing as an actor, director and youth workshop leader, I am also on the board of the Westacre Arts Foundation.